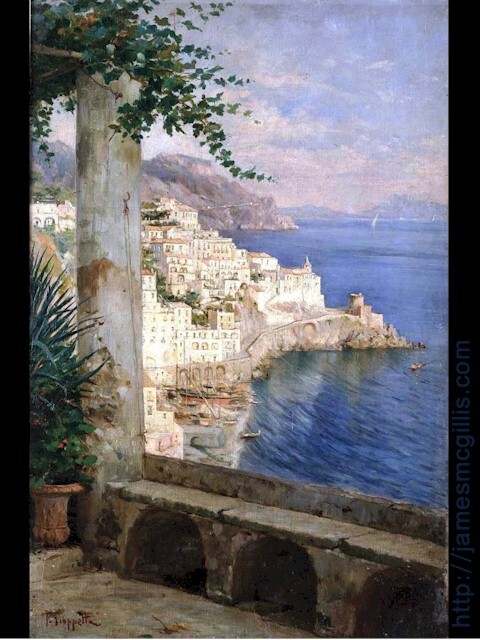 Another Costantino Proietto Painting of the Amalfi Coast is Revealed. 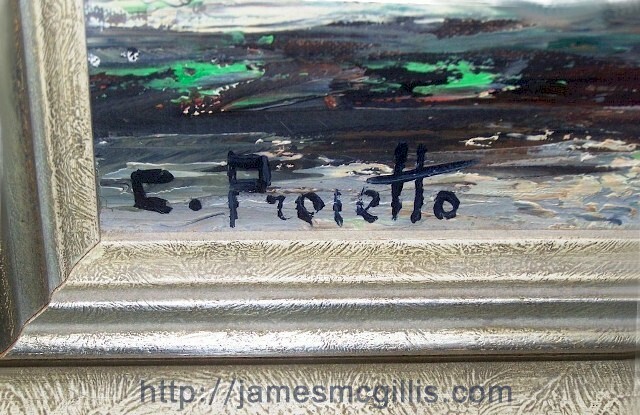 We recently discovered that the signature on our oil painting of the Amalfi Coast is “C.Proietto”. Since then, I have been on a quest to find out more about, “The Man from Amalfi”, Signore Costantino Proietto (1900 - ?). Soon after posting my original article on that subject, Ms. Marion Grayson of Belton, Texas sent me an image of her own C.Proietto. It is yet another Amalfi Coast masterpiece. Although foreground objects differ, and the field of view varies, each painting was of the same place, by the same artist. On the terrace of the hotel from which he often painted, only the potted plants had changed. Even before seeing his signature, my heart leapt. Here was yet another window in time, created by the master in residence, Costantino Proietto. The quick answer to Darold’s question is; historically no, but in the future, perhaps. From the limited biography available for the artist, only postwar tourists to Italy purchased his paintings from their source. Since initial purchases were in the 1940’s and 1950’s, many C Proietto paintings are now passing from one generation to the next. In our case, we are third-generation owners of our painting. In most cases, C.Proietto provenance is hard find. Current owners often know who first owned the painting, yet few details of purchase remain. Although an artist of note could counterfeit his works, recent auctions value an original C.Proietto at or below $1000. Short of forensic analysis, C.Proietto’s unique signature is the best test of authenticity. I cannot imagine anyone copying that multifaceted signature and making it look right. In an effort to strengthen their provenance, some later C.Proietto paintings had wax seals and other documentation attached. 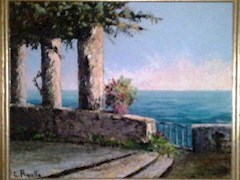 Bennett’s is the third C Proietto Amalfi Coast painting to surface on the internet in the past month. With such rapid additions to the artist’s known body of work, we wonder how many more examples may exist. We picture many a living room graced by an attractive oil painting depicting a classical Italian scene. Is that the new owner, staring at an enigmatic signature, executed with blue paint so dark that it looks black? At least one letter in each of the artist’s signatures will be enigmatic, if not indiscernible. 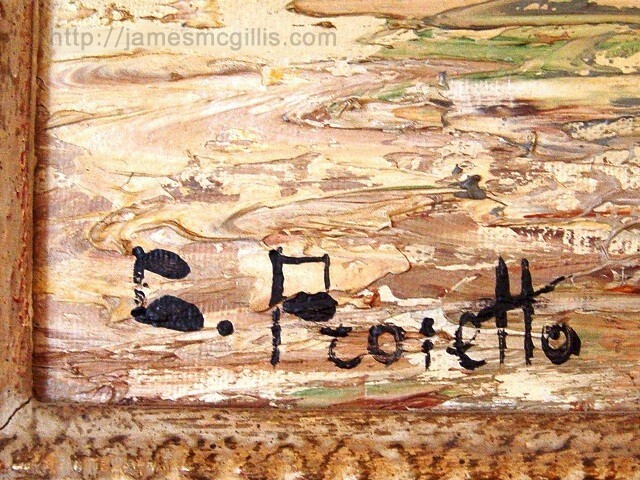 Over time, each owner of a C.Proietto painting shall decipher the signature code, conduct a Google search and find that he or she is among friends. If each who discovers their own C.Proietto masterpiece provides us with information on their painting, I shall publish it here. In Ancient Egypt, Pharaohs appeared as a blend of human and deity, manifested here on Earth. If their god-side was to penetrate eternity, so too must Pharaoh's image. Even today, viewing one of their funerary masks “in person” can send a chill up your spine. In that moment of mutual recognition, we validate another Pharaoh’s quest for eternal life. On what date Costantino Proietto lifted his final canvas from its easel and sold it to a tourist for a few hundred dollars, we do not know. All we know is that sometime in the second half of the twentieth century, C.Proietto painted his final masterpiece. Each unrecognized painting waits for its owner to decipher to its signature. Like the mask of an ancient Pharaoh looking back at us through time, each locked Costantino Proietto signature awaits its key. In fact, human consciousness is the key to All that Is. By Larry LoCastro on February 3, 2012 05:37 AM | Link to this comment. By Nancy Shimkus on July 11, 2012 08:14 PM | Link to this comment. Hi Jim, my church recently received an original painting by Costantino. Would you be willing to provide a mailing address to me so that I may send you the photographs I have taken of it? Thank you. By Jonathon Cassel on October 30, 2012 06:18 AM | Link to this comment. I have one of C.Proietto's works! I love it. My family bought it while stationed overseas in the early 1950's. I can send you a pic of it if you like.